Dana is a resin ball-jointed doll by Latidoll. She’s from Lati’s Green Line, and has the Grown-up Coco head mold. Lati opens for orders quarterly. 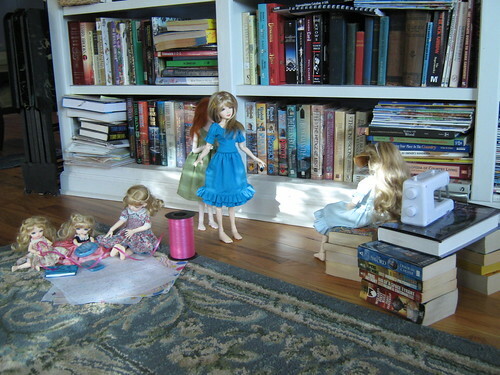 When they’re not open, all the dolls will show as “sold out.” Keep checking back. 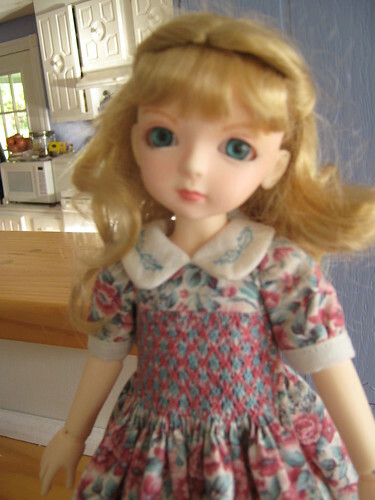 I purchased her as a basic doll (blank face, no wig or clothing) directly from Latidoll in the summer of 2008. She has normal skin tone, and faceup by me. The wig pictured is “Lexy” by Monique in Golden Strawberry. Her eyes are 14mm green acrylics purchased from Junkyspot. She is 30cm, just shy of 12″ tall. In the Sullivan clan, Miss Dana is the second oldest. She’s very responsible and often takes care of her four younger sisters while her older sister works. While she’s generally good-natured, this responsibility has made her a little bit bossy. 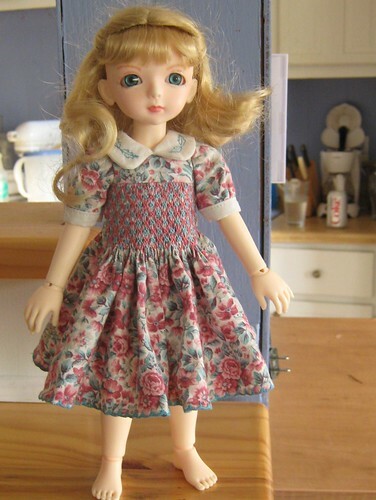 In the photo below, Seraphina models an outfit Ciara has just finished for an order. Audrey helps to lace it up while Ciara eyes her work critically. Dana sits on the floor, keeping two of her younger sisters busy with the wrappings so they stay out of trouble. This entry was posted in BJDs, Collecting, Doll Profiles and tagged abjds, ball-jointed dolls, bjds, coco, lati green, latidoll, tinies. Bookmark the permalink.